The SLA Information Book Award is an annual event celebrating information books. It is designed to support school libraries, reinforce the importance of non-fiction and highlight the high standard of resources available. 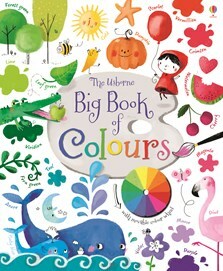 An early learning journey through a world of more than 130 colours, this book includes a colour wheel to turn and see-through acetate pages to discover what happens when you mix colours together. This book examines colours not only from the artist’s perspective but also covers quirky information and metaphorical usage. The moveable colour wheel explains colour matching, then each double-page spread looks at how colour is mixed, examples of objects of that colour, various shades and common expressions. The author lists colours associated with different moods too. The illustrations are appealing and witty from the contents page in the form of an artist’s palette to a flappable acetate page to show changing colours. This book will be the start of many conversations with young children.